Part of my success this time around I think has to do with the fact that I am paying for my own education. Since I’m invested financially, I’m just stupid to waste my own money. Overcoming my propensity to procrastinate has also been quite the challenge and with the importance of group projects, keeping in contact with other people that may not share the strange Dot Com Lifestyle Schedule has been interesting. That prompted me to hunt for an online collaboration tool that would allow me to keep in touch with everyone in my group and to share work and collaborate all without having to physically meet up. That search led me to Glasscubes. Through the power of Twitter, I was approached, or rather, tweeted by Sophie Le Brozec of Glasscubes. I tweeted that I was looking for a web based CRM system that could support my group for collaborating on our term project for Marketing Strategy. She suggested that we try out their new online collaboration software that launched on October 13th of this year. 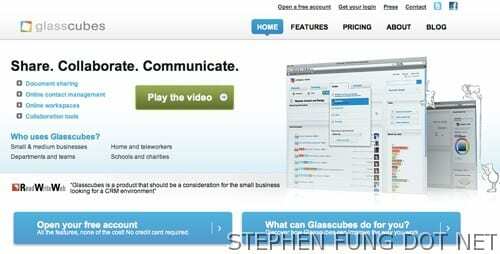 Glasscubes is an online collaboration tool that incorporates aspects of CRM and Intranet. The software is available exclusively on the web and unlike other more complex CRM solutions, does not require you to install it on a server, or download a client to access it. The clean and inviting interface encourages you to explore and become productive almost immediately. After spending the last couple weeks using with one of my class project teams who is working on some marketing strategy for a winery, I’ve quickly fallen in love with this very useful and affordable tool. Here are few things that I love most about this online tool for sharing, communicating and collaborating. Glasscubes’ “Cubes” function provides for the ability to create workspaces for different projects that you’re working on. For example, I’m working on a project for Pacific Breeze Winery with my group and in order to organize our thoughts, documents and files, we’ve created this space to keep all of the related information together. The beauty of the cubes is that each one is isolated from the others so that only the people that should be viewing the project can view it. This includes all the tasks, files and appointments related to a particular cube. The cubes also allow you to invite people that may not even be part of your organization to join in with the collaboration on each cube. For example, you can invite your professor in to view the progress of a project you are working on for the class without revealing any other projects you are working on. One of the great features of Glasscubes is the ability for the system to help you see visually what tasks are related directly to you. The “Personal” tab allows you to keep track of all the items related to you, from tasks to current discussions to comments on files you’ve uploaded for further collaboration. If you’re using the CRM functions, you can even see cases and opportunities that are assigned directly to you. To the right, you can quickly see which “Cubes” you’re able to access or are a part of. One of the things that I liked about the personal tab was the fact that you can schedule in all your availability. This allows your group to select the best times to schedule a meeting or conference call. I really liked the fact that I could also see when people were collaborating on documents and discussions you may have opened, giving you a timeline of all related collaboration. Glasscubes offers some basic CRM functionality that can be very useful to companies that don’t need a full blown solution. Clients and contacts are added through the “Connect” tab and from that one can effectively manage sales opportunities and even customer service issues. These opportunities or issues can then be assigned to the right person on staff to take care of and they’ll be able to see these assignments in their “Personal” tab when the login. Of course, from assignment to resolution, the steps can be tracked and shared with others in the company. We never used the opportunities or leads functions on our project with the winery, but having used other more complex systems in the past, the Glasscubes approach is definitely more simple and I can see companies taking advantage of it simply because it is easy to use and understand. Of course, Glasscubes does allow you to import your contacts from any number of contact management solutions such as Outlook or any other software that dumps to a CSV file. You can even export lists out to use for targeted marketing use. As I mentioned earlier, using the Cubes, you can upload files related to that Cube only keeping things private and allowing you an easy way to track what files belong with what project. While this in itself is pretty cool and Glasscubes allows you to upload pretty much anything you want, from MS Office Files, PDFs, to pictures and videos (it even labels the files as a DOC, XLS or IMG etc), the best part of this system is the fact that you can edit files like DOCs and XLS files right in Glasscubes. After selecting the file and locking it for edits (so that no one else can alter the file while you’re working on it), Glasscubes will launch an editor allowing you to work on the file as if you were working on it in WORD or EXCEL. You can do your edits and then save it as a revision, allowing your group to keep track of versioning and changes. Like most areas of Glasscubes, members of your group can leave comments and suggested changes for you. Other great features include a useful search function and the ability to label things so that they can be easily found. As you start to label more items, the the labels show up in a list in the right sidebar, and even show how many documents are related to that label. Like how documents, tasks and even schedules can be related strictly to a single cube, discussions can be related to specifically to a specific cube. We used this function a lot to discuss different aspects of our project from our presentation plans to what additional work and tasks needed to be undertaken to complete our project. This also helped cut down on ineffectual email traffic and allowed us to track our conversations so that we don’t keep repeating ourselves. You can even post polls to democratically decide the direction a project should take. Outside of the Cubes, Glasscubes labelled the open discussion area as the “Coffee Break” where anyone can post a topic and get feedback on non cube specific items. The Glasscubes put in an example “Coffee Break” post asking about who would be running the NYC Marathon, for example. As I learned in my CRM class, there is a huge range of pricing for CRM solutions. Most of the time the cost is so high that most businesses that could benefit most from a CRM simply can’t afford it. The best part about Glasscubes is that depending on what your needs are, you start at FREE and can scale with the system as your business grows. The basic FREE account gives you a maximum of three users plus 2 cubes, up to 100 contacts and up to 100MB’s for storing your files: Perfect for most school project needs. 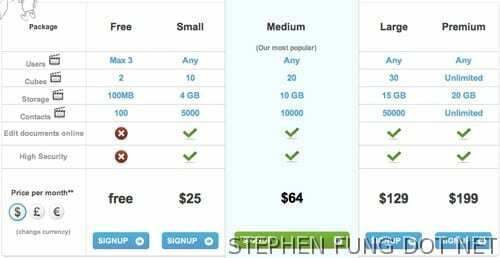 Their most popular account is the medium package ($64US per month) which gives you an unlimited amount of users, up to 20 cubes, 10GB’s of storage, up to 10,000 contacts. This package (along with the lower end small package – $25US per month) allow additional security enhancements including the ability to edit documents online: something that the FREE package does not have and is one of the coolest parts about Glasscubes as I noted. As you head up the product line, you get more storage, more cubes, and the ability to add more contacts. All of Glasscubes products come with a 28 day free trial so if you’re sure the FREE product won’t work out for you, can take one of their larger packages for a whirl. You will have to enter in a credit card number though which can be a bit of a turn off for some. After a solid two weeks using the system with my class project team, I’ve found this system to be a huge asset to any collaborative project. With everyone on different schedules, this system has been an effective hub of communication and collaboration for our team. We’re able to work when it is convenient and assign tasks as necessary to get the job done, while staying in contact offline, making our online meetings that much more effective. It has also cut down on the huge amount of email clutter we would have dealt with, emailing attachments back and forth and potentially repeating things that we’ve already gone over. Since launch, Glasscubes has been continually improving their product offering and working out the bugs. You can keep track of all the new developments on their corporate blog. I was really impressed at how quickly an issue I was experiencing at the beginning of my trial was taken care of, even on a weekend. It’s clear that someone on the other end was using effective CRM to solve my problem lickety split. Whether it’s for school, managing projects for your consulting practice or dealing with sales leads, Glasscubes seems to be a great alternative to more complex and more expensive systems on the market. The fact that it is completely hosted online and can be accessed anywhere by any of your team members is also a huge convenience. I definitely recommend it for anyone that wants to be more organized and more effective when dealing with any task requiring collaboration with others. PS: We’re giving away an ULTRA Products 750 Watt Modular ATX Power Supply over at Futurelooks. Check out the contest details to find out how to win it!